I’ve been busy, literally digging into stuff. The morons who built my house screwed up, so heavy rains gave me a wet basement. 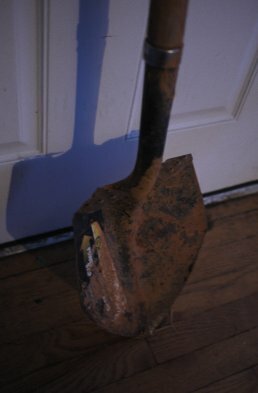 By digging, I’ve been able to seriously whack my electric bill, saving ridiculous amounts of Watts. More explanation: the property was not graded properly. A house is supposed to be surrounded by a mild slope, causing rain to run off away from the foundation (and any basement if present). Failure to grade leads to a damp basement, and in extreme cases foundation damage or settling. My basement was damp in general, and certainly after serious rains, so I decided to take matters into my own hands. I’ve been digging for months now, adding drainage features. Then I threw the spoil toward my walls, to alter slopes. I’m not even finished, and already I’ve been able to turn off the dehumidifier in the basement. Without it, the electric bill fell sharply. The first month, I didn’t pay attention much. The second month was a coincidence. The third month, however, showed me the dehumidifier had been the one biggest energy use in the house, since my electric bill is now half. Yes, half. Just digging cut my electricity use in half, and my EV is now “paid off” (in wattage terms) several times over. And the other tire drops: Brammo, that electric motorcycle company that talked a big talk, now tanks big time. After not even three full years of Empulse motorcycle sales, Brammo, Inc. now ceases to exist as an independent entity, having been bought out by Polaris Industries (makers of ATVs, snowmobiles, the Victory and Indian gasser motorcycle brands, etc.). Whether they will exist at all is now Polaris’ play. The first public clue was Brammo announcing an “end of season” clearance sale. An end of season sale last August. Personally, late August/early September is when my riding season is in its second wind, literally. Anyway, Brammo slashed prices by about half on some bikes. Then it was seen that dealers- such as they were- still had 2013 Brammo Empulses to get rid of. They still had clearance Empulses into 2015. The second public clue were the reports of little or no activity at Brammo headquarters/factory in Oregon. The OneWheel “uni-skateboard” is back. After last year’s debut, they have succesfully delivered units to Kickstarter backers by Christmas. Reports are that the finished product is pretty polished, and some even got to ride it. Acton RocketSkates had broken cover before, but CES made it official. Like OneWheel, they’re “segwayfied” transport, but in rollerskate form, not skateboard. Boosted Board’s e-skateboard was also known, but now cut by hundreds of dollars. The big news: Gogoro’s electric scooter and “ecosystem,” which I’ll discuss later. In established manufacturers, BMW and Mercedes had splashy autonomous car demonstrations. Stay tuned, apparently they’ve got more energy than I do. Again, welcome to 2015. And a happy 2015 it is, at least in energy. Not only have LED lamps fallen in price drastically from just a few years ago, but they continue to improve, in multiple respects. Cree, one of the bigger names in LEDs, didn’t just release their groundbreaking lamp about a year ago. They’re now on their generation-2 product, and yes, competition has improved the breed. I wrote previously that coal is just not that hot of a fuel. Compared to natural gas, coal isn’t logical for electric generation, and getting less and less logical with time. Meanwhile, solar power is getting cheaper every year, with grid parity on the way in a few short years (maybe one). In some places, parity has already been reached. Coal pushers still try to tell us that they’re the reliable, American energy. The claim is that solar (like wind or other renewables) varies, and cannot keep power grids stable and consistent in the face of demand. What they conveniently forget to tell you is: Coal isn’t too hot at that, either. As solar prices keep crossing parity, along with the rest of the portfolio (gas, nuclear, hydro, wind, etc. ), there will soon be no credible pitch for coal. My advice: get out. If you’re exposed to coal financially, sell. If you’re actually looking at a coal seam, get out via the nearest exit ASAP, and find a new career. Of course, nothing ever really goes away, as I’ve stated multiple times. There’ll be a transition period, and even after that the grid will cling to legacy plants. However, there is no coal growth on the horizon; it’s a matter of coal staying level or contracting, and at what contraction rate.